Final Fantasy Fables: Chocobo’s Dungeon passed the “cutest Final Fantasy game” crown to World of Final Fantasy and its hordes of adorable critters in 2016, but that’s okay. The 2007 Wii game, remastered today for the Switch and PlayStation 4 and renamed Chocobo’s Mystery Dungeon Every Buddy, is still one of the sweetest and purest roguelike games around. Chocobo and his adventuring partner Cid, after being sucked into a vortex during a treasure hunt, find themselves transported to the small town of Lostime on the island of Memoria. When the town’s clock tower chimes, its inhabitants lose all of their memories. A mysterious green-haired baby drops from the sky, granting Chocobo the ability to warp into the heads of the island’s inhabitants. Conquering the dungeons found in their minds brings back their lost memories, so it falls upon Chocobo in his various adventuring classes to unravel the secret to the clock tower and save Memoria. While many modern games include roguelike elements, like procedurally-generated levels or permadeath, Chunsoft’s long-running Mystery Dungeon series adheres closely to the original roguelike formula laid down by the role-playing sub-genre’s namesake, 1980 PC game Rogue. 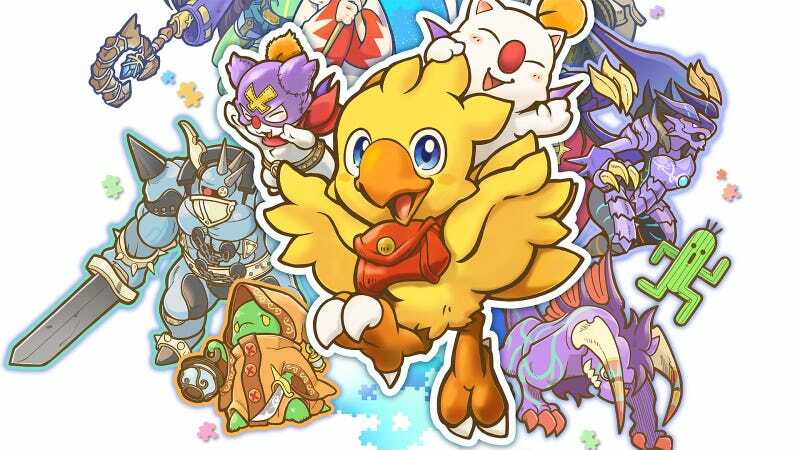 Chocobo’s Mystery Dungeon sees the titular Final Fantasy game fowl traversing grid-based, procedurally-generated dungeons. Enemies populating these dungeons move when Chocobo moves. Every action the feathered hero makes—taking a step, attacking, using a spell or special ability or drinking a potion—is followed by enemy actions. If Chocobo kicks a slime in the face, a dragon on the other side of the dungeon moves a square. Hey kids, it’s Kotaku.com’s Tim Rogers! These strict rules on how actions and turns are taken give players the opportunity to employ strategy as they delve through the game’s dungeons. Since every step heals a point of damage and restores ability points for Chocobo, sometimes running away is a good call, avoiding enemy attacks until health is refilled or another special ability can be used. Enemies are restricted to moving along a grid, so finding a tight corridor to battle in is better than fighting out in the open. And since dying ejects Chocobo from a dungeon with none of the loot he’s collected along the way, discretion is often the better part of valor.